Students will be able to sort and categorize objects based on their characteristics. Begin the lesson with engaging questions such as: "Were you ever asked to put something in order, like food or clothing? What things did you organize? Why did you need to organize the items?" Explain to students that today, they will learn the definitions of "sort" and "categorize" and will learn to sort and how to categorize objects. 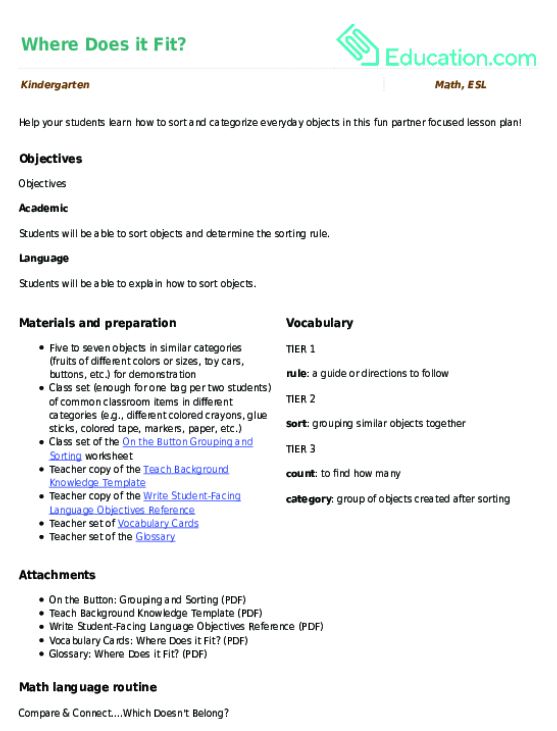 Preview the content-specific vocabulary using examples (displaying different categories) as well as providing definitions in students home language (L1) if possible. Ask students, "Have you ever put things into groups, like your toys or books?" and have them turn and talk to share with a partner. Present a group of inedible fruit to the class. In that group, place an odd object, like a vegetable. Explain to students that they will encounter times when they need to sort things. Sort means to organize something in a specific manner. Give students examples of sorting, such as when parents organize school supplies, plates or socks to be put away. Explain to students that sorting will help them put information together in their minds to make sense of it. Tell the students, "You have a group of fruit. You were asked to put all of the fruit together." 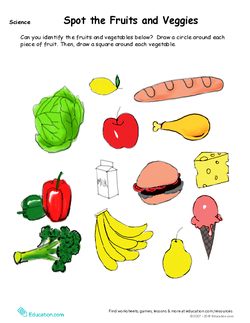 Show the students how you separated all the fruit and left the vegetable to the side. Ask the students why they did not include the other object. Conduct another showing of the fruit, but change out the vegetable to a shoe. Ask a student to place all of the fruit to the side. Ask the student why they did not include the shoe. Explain to students that the objects were sorted. Ask students what was sorted and why the other object was not included. 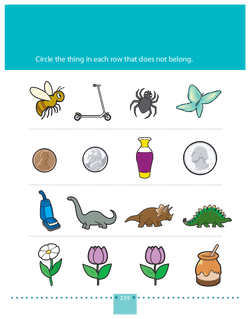 Ask students about other ways that objects can be sorted. Explain to students that we need to categorize the objects. Categorize means to put the objects in different groups based on features they have. For example, bring out a green apple, green grapes and a honeydew melon. Separate the honeydew melon because it is big. Place the grapes and apple together because they're green. Ask students about other ways we can categorize items. Show a toy catalog and show how items were categorized from the beginning of the list. Repeat this process with each group of objects in the lesson. Work with a smaller group of students and model how to sort the fruits and vegetables. Have students identify the item that doesn't belong using a thumbs up/thumbs down. As you practice putting items in groups, pause to allow students to turn and talk to share what they think doesn't belong. Have them use the sentence frame, "I think the __ __ __ __ doesn't belong because __ __ __ __." Give all students the What Does Not Belong? worksheet. Explain to students that this is the same activity, but now on paper. Explain to students that each row is different. Remind them to start at the first row. Tell students to cross out the object that does not belong in the group. Once they've completed their worksheets, organize the students into pairs. Tell pairs that they'll each get a mystery bag; they'll need to sort and organize the objects inside of the bag. Different students will sort and categorize objects in different ways. Have each student take a turn and explain how he sorted the objects his partner. He will then explain how he categorized the objects. 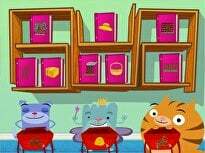 Remind students not to remove the order of the toys until they explain both how they sorted and categorized their objects to their partners. 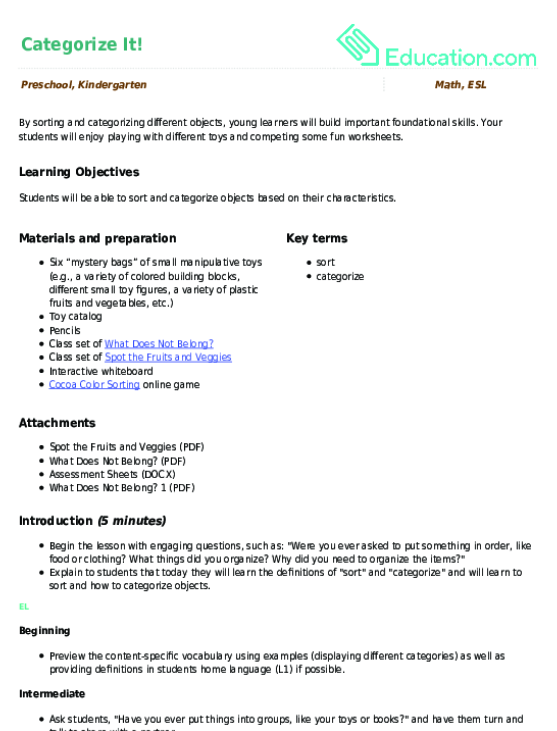 Pair students together to complete the What Does Not Belong? worksheet. Have students identify the items that don't belong by pointing to the item on the worksheet. Have partners share why it doesn't belong with their peer. Provide students with sentence frames to use to explain how they sorted and categorized their objects: "I sorted these into groups of __ __ __ __ and __ __ __ __ because __ __ __ __." Explain to students that they will complete the same activity without a peer. 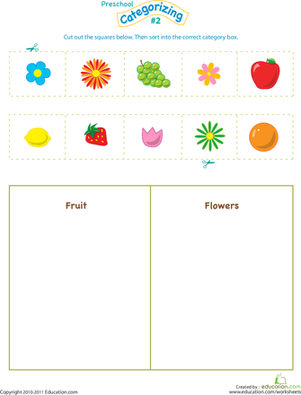 Have students complete the Spot the Fruits and Veggies worksheet. Tell students to cross out the fruits and circle the vegetables. Tell students to each get a mystery bag once they have completed the worksheet. Ask students to pick one mystery paper bag without looking inside. Ask students to sort and categorize the objects from the bag. Remind students not to remove the objects until the teacher has seen how they sorted and categorized their manipulatives or toys. Work with a small group of students at the same table to provide guidance and support. As they finish sorting their objects, have them practice thinking aloud and support students as they explain their sorting. Pair students together with a partner to share the categories they came up with in each group. Advanced students can extend their knowledge of sorting and categorizing by copying the words of the objects on sticky notes and sorting them into specific categories. Sight word flashcards can be used for the same purpose. Struggling students can be offered one-on-one support. Ask them questions to increase their critical thinking skills, such as. "How is this object different and the same?" or "Why did you place this object in this category?" In advance, write students' names in the blank spaces on your assessment sheet. During working time, walk around the classroom and observe how students are sorting and categorizing the objects on their worksheets and in their bags. Check boxes for mastered skills. Place an “X” in the boxes for not mastered skills. As you take anecdotal notes about student progress, be sure to note if students are struggling with language or content in order to address their needs. Ask students to share with you what they are doing. 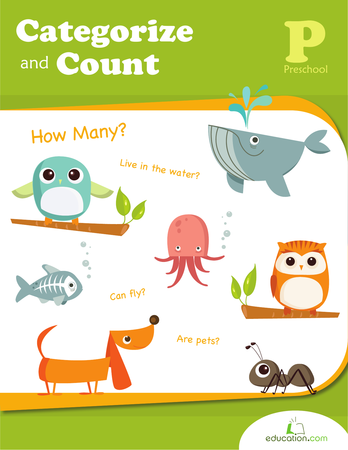 Ask questions such as, "How did you sort your objects? Can you show me the categories?" Display the Cocoa Color Sorting online game on the interactive whiteboard. Explain to students that this is a color sorting and categorizing game. 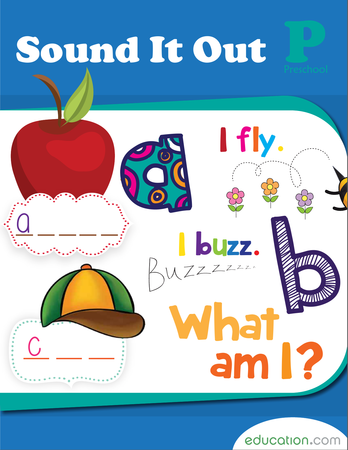 Allow students to listen to the character’s question and rephrase the question if necessary. Allow students to click on the answer. If it is not correct, ask the student what could possibly be another answer for the question presented. If it is correct, ask students why it is correct. Allow another student to participate in the activity. 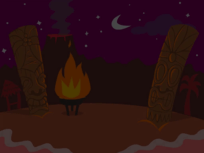 Continue in this manner until the game is complete. Model how to play the game before playing with the group. As you read the questions, have students turn and talk to a partner to answer the question in their own words. Have students reflect on the lesson by having them turn and talk with a partner to answer the questions: "What did you enjoy about the lesson? What was challenging?" Is it a square? Is it a triangle? 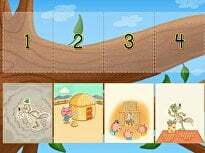 This cut and paste worksheet will help your child categorize quadrilaterals, which are four-sided shapes. Are they big or small? Are they purple or brown? 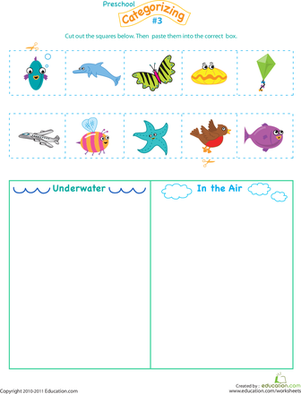 Help your child sort bears into categories with this lovable worksheet.